Most developed countries substantially increased social-welfare spending during and after the global financial crisis, but in Europe many people seem ready to ratchet government spending back down. 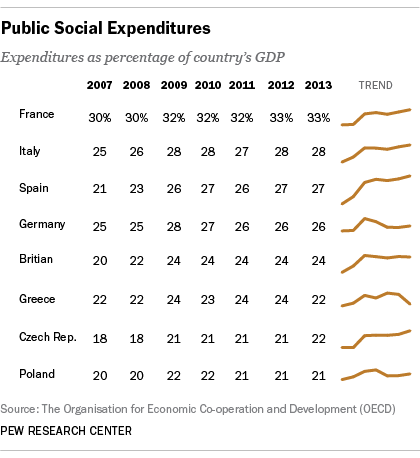 According to new estimates for 29 countries from the Organization for Economic Cooperation and Development, France spends the most public money on social-welfare programs as a share of its total economy: an estimated 33% of GDP this year, up from 32.5% last year and 29.7% in 2007. 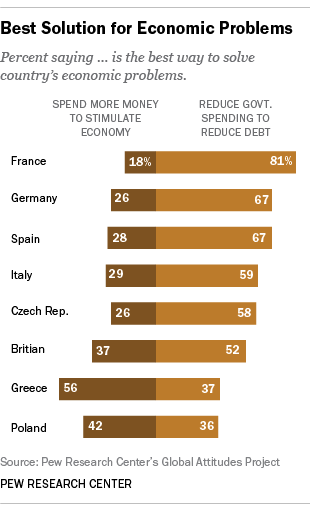 Interestingly, the French also were most likely to support cutting government spending as a solution to its economic problems, according to the spring global attitudes survey by the Pew Research Center: 81% of the French public said they preferred cuts rather than trying to stimulate the economy through increasing government spending. That was the highest support level for cuts among eight European countries (the only ones in the global survey that were asked that question). However, majorities in five other countries also said they favored cuts over stimulus; Greece was the only country where a majority of those surveyed favored stimulus over cuts, while Poland was closely divided. The findings suggest that, in most countries surveyed, people think government social expenditures may have reached — or exceeded — their limit. That includes some countries, such as Spain and the Czech Republic, where social expenditures have continued to climb as a share of GDP. The OECD defines “social expenditures” to include old-age pensions, health care, unemployment insurance, job-training programs, disability and survivors’ benefits, housing assistance, family-support payments, and similar programs — both cash payments and in-kind benefits. The organization has detailed statistics through 2009 and estimates of aggregate social expenditures as a share of GDP for 2010-13. Among the 29 countries for which there is consistent data through 2013, the OECD figures show a sharp uptick in public social spending in 2009, when the median rose to 23.6% of GDP from 20.8% the year before. Since then, public social expenditures as a share of GDP have fallen in 16 of the 29 countries; the biggest reductions have occurred in Hungary and Estonia (both down about 2.3 percentage points), Ireland (down 2 percentage points) and Greece (down 1.9 percentage points). Among the 13 countries where public social expenditures increased as a share of GDP between 2009 and 2013, Australia had the biggest increase, 1.7 percentage points; at 19.5% of GDP, public social expenditures represent the biggest share of Australia’s economy since the OECD began collecting data in 1980.